My wife joined me on a business trip to New York City in 2004. I took an afternoon off to give her tour of my old neighborhood – Battery Park City in lower Manhattan. It looked a lot different than I remembered. That’s because there was a giant crater across the West Side Highway from where I used to live and work. It was the 16-acre site where the World Trade Center once stood, before its twin towers were reduced to scrap metal and rubble by Islamic jihadists using fuel-laden jetliners as weapons of mass destruction. As I toured what was then a makeshift memorial at Ground Zero in homage to the nearly 3,000 Americans mass murdered on September 11, 2001, I wasn’t as mournful as I expect. Instead, I felt white-hot anger at the perpetrators of the atrocity. If they felt no remorse for their slaughter of innocents, I thought the United States entitled to an eye for an eye, tooth for tooth, hand for hand, foot for foot. After all, I rationalized, “was there not a cause?” Hadn’t the radical Islamists invited destruction not only upon themselves but also their peoples? 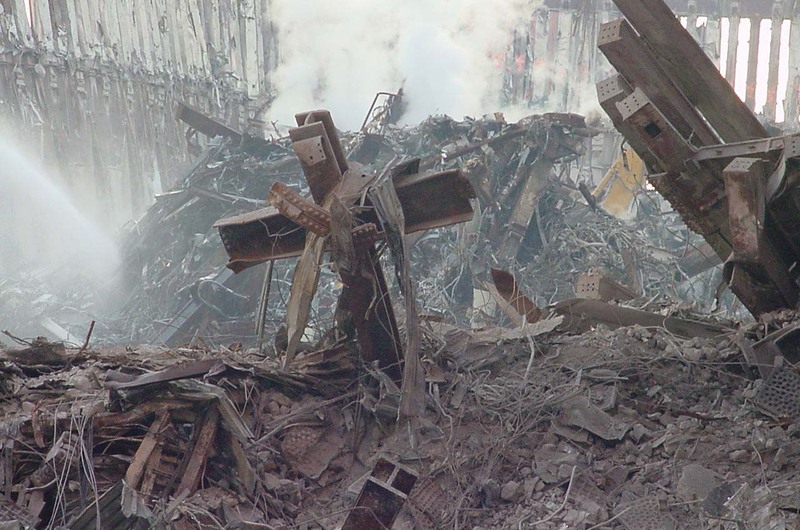 Then I saw the World Trade Center cross, which somehow survived the collapse of the twin towers. It reminded me that God was still on the throne. And that vengeance was His alone. That doesn’t mean that God expected America to turn the other cheek after Al Qaeda perpetrated the September 11 terror attack on our country. Nor does it mean the Almighty expects ours to be a nation of pacifists. Indeed, the Bible is not a suicide pact. So, as we mark the 16th anniversary of that great and terrible day when 19 sons of perdition aboard four commercial airlines took the lives of several thousand men, women and children, let us not delude ourselves that if we simply keep our peace our sworn enemies will leave us alone. In words attributed to Thomas Jefferson, “the price of Liberty is eternal vigilance.” Over the entirety of this nation’s history, that price has borne primarily by followers of Jesus Christ. And the evidence may be found in U.S. military cemeteries – from Arlington to Pearl Harbor to Normandy to Okinawa – where crosses adorn the final resting places of hundreds of thousands of America’s sons who paid the forfeit for their country. Today, America is beset by new enemies. ISIS threatens a “wave of attacks” against our country and its allies. Pyongyang threatens to bring America to “a miserable end.” And Iran threatens to “depose” our president. But the barbarians at America’s gates will not prevail. Because God protects our nation for the sake of those who follow after His son. And if God be for us, who can stand against us? 11 Sep	This entry was published on September 11, 2017 at 4:51 AM. It’s filed under WAR and tagged AL QAEDA, CURRENT EVENTS, GROUND ZERO, IRAN, ISIS, PYONGYANG, RADICAL ISLAM, SEPTEMBER 11, TWIN TOWERS, WORLD TRADE CENTER. Bookmark the permalink. Follow any comments here with the RSS feed for this post.